In the early 1800's William Strutt invented a completely new and ingenious clock using epicyclic gearing. This is my version of Strutt's amazing mechanism. This Epicyclic is spring driven with a constant force spring and will run about 40 hours on a wind. 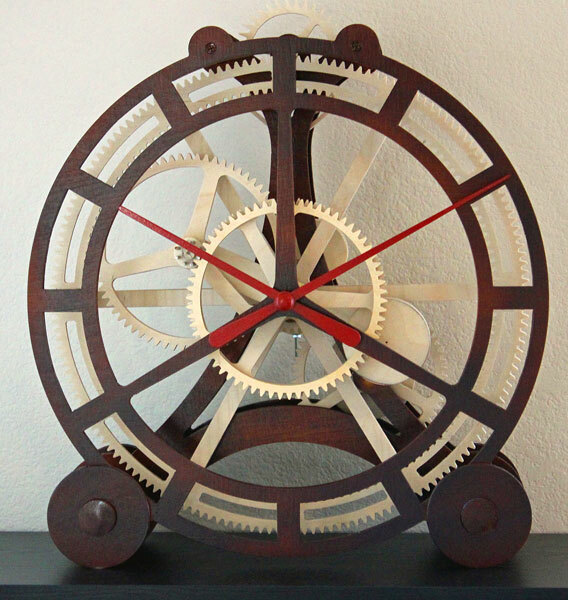 This clock has the most amazing epicyclic motion train, too, in that as the epicyclic wheel is traveling around the "sun" gear attached to the frame, a second wheel with two more teeth mounted behind it is being forced to slowly move the hour hand along as the 8 pinion revolves around its circumference. There is a great amount of movement everywhere inside this strange and unique clock. The Epicyclic is a mantle clock and stands about 20" high. Adrian makes such wonderful videos! You should check out his YouTube channel. Thanks, Adrian, for the test build and the video. Epicyclic Clock plans are available only in dxf format via email attachment. As with all of my Masochist's Corner designs, the Epicyclic does not come with a separate set of instructions or a materials list. 1. Have a CAD program that can read dxf's (or know of a business printer that will print them for you).